These days we are totally spoiled by the choice of websites we can access as language learners! I have put together here a list of my very favourite websites which I go back to time and time again. Linguée English-French dictionary for translators. Search for a word or a term and you will get a list of suggestions in a range of contexts which have been submitted by translators. Comme Une Française – Géraldine’s wonderful videos explain French language and culture in English. Français avec Pierre – Pierre and Noemie are very endearing! There are podcasts and videos where French language is explained in clear and simple French with a transcript below. Français Authentique – Johan creates podcasts and videos explaining French language and culture in clear French. One Thing in a French Day – in these podcasts Laetitia talks about her day in French. You can access free material or pay for the full text and exercises. Podcast Français Facile Vincent makes podcasts to teach French in French. He creates dialogues and also goes into more detail in short videos. AudioLingua snippets of French (and other languages) contributed by members of the language-learning community. FluentFrench for pronunciation and I particularly recommend David Tolman’s oral gymnastics course. Geri Metz provides some free sample lessons on her site PronouncingFrench.com. Her pronunciation lessons are also free on YouTube. Forvo a pronunciation dictionary – you can search to see if someone has already provided a sound file for the tricky word you need help with and, if not, you can put in a request for someone to make one for you. For grammar and much more: Lawless French. Laura K. Lawless used to host the AboutFrench website but now has her own excellent site. 1jour1actu – videos explaining current affairs made easy for French children. What are your favourite language-learning websites? Please share your ideas by leaving a comment. Are you looking for a great present to offer to a lover of French? Take a look at my book Je mourrai moins bête: 200 French expressions to help you die less stupid! 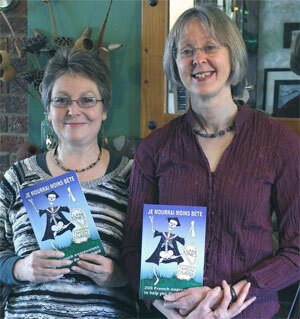 You can download chapter one for free at www.figureoutfrench.com and buy the book from Amazon or Oundle bookshop. If you have already bought it and enjoyed it, please leave a review!